*30 amp-150psi for 12v. System ONLY. 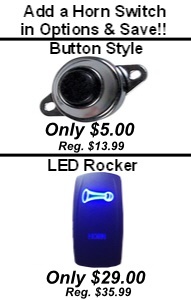 *Illuminated Dash Panel gauge w/ON/OFF Switch. *Pressure Switch w/Built in Relay. *20 Feet Air Lines Tubing. *1/4" Quick Connect Coupler for other Air Needs. *Female and Male Electrical Connectors. *Cable Ties and Cable Tie Brackets. 0 to 105 PSI -----1 Min. 27 Sec. This Viair heavy duty on board air system produces a whopping 150psi. The Viair 400c compressor is 33% Duty at 100psi. The 2.5 gallon air tank is small enough to be mounted under and truck or SUV. It could also so fit easily in a trunk of most cars, truck bed or tool box. 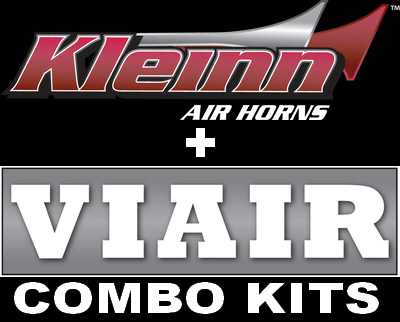 This Viair Kit is perfect for air supply for this horn, air spring kits or air lockers and even air tools. This 400c compressor will inflate a tire rapidly. The kit includes the Viair patented air filter relocation kit. This way the 400c air compressor can be mounted under the vehicle and filter can be in a location that is clean. Ideal places for the air filter is in engine compartment or inside the vehicle cabin under a seat or under a bed rail is also ideal. This will extend the life of the compressor greatly. 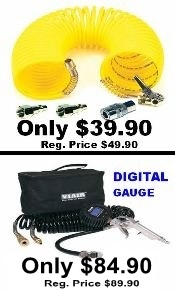 This Viair quarter duty kit includes a 2” air pressure gauge along with a on/off switch. The Viair 110psi ON and 150psi OFF pressure switch / relay combo makes wiring a breeze. This kit includes all the necessary fitting for install.